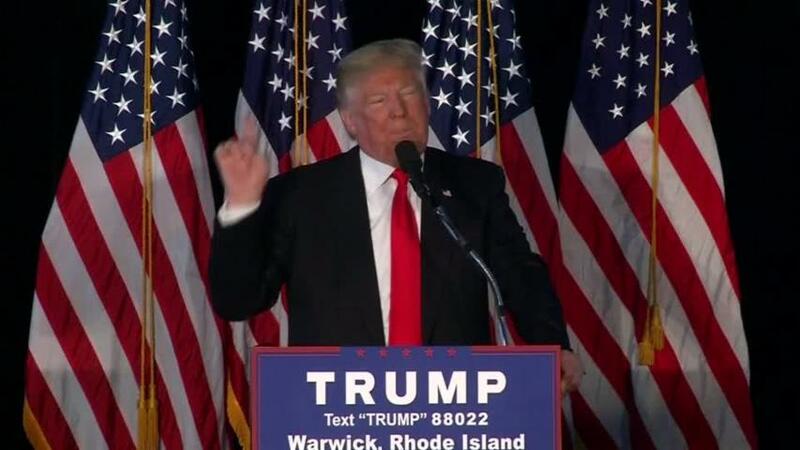 Donald Trump implored his supporters in Rhode Island on Monday to "lock their doors" to keep safe from Syrian refugees coming into the US. At a rally in Warwick, Rhode Island, Trump suggested that refugees might be affiliated with the terrorist group ISIS (also known as the Islamic State, ISIL, or Daesh). He mentioned that some Syrian refugees have been resettled in the state. "Now here's one I don't like," Trump said, reading off a piece of paper. "Syrian refugees are now being resettled in Rhode Island." We don't know who these people are. We don't know where they're from. We don't know where they're from. They have no documentation. We all have hearts and we can build safe zones in Syria and we'll get the Gulf states to put up the money. We're not putting up the money, but I'll get that done. But you know what? We can't let this happen. But you have a lot of them resettling in Rhode Island. Just enjoy your — lock your doors, folks. The response from the crowd seemed mixed, with some people chuckling and others shouting. "No, it's a big problem! We don't know anything about them," Trump shouted. "We don't know where they come from, who they are. There's no documentation. We have our incompetent government people letting 'em in by the thousands, and who knows, who knows, maybe it's ISIS." Trump then cited the December terrorist attack in San Bernardino, California, in which officials said the two suspects were inspired by the terrorist group. "You see what happens with two people that became radicalized in California where they shot and killed all their coworkers, OK?" Trump said. "Not with me, folks. It's not happening with me." President Barack Obama recently alluded to Trump's rhetoric, which critics have cast as anti-Muslim, calling such speech "dangerous." Trump has been warning about the US letting in refugees for months. He has proposed barring Muslims from entering the US until the terrorist "problem" is under control. Experts have said that this kind of rhetoric can fuel radicalization because it further divides people, playing into fears of foreigners and Muslims.